Please come! There will again be extra credit for attending. Come to the nexUX Meetup! How can UX and neuroscience help develop a game? These disciplines provide very concrete and easy-to-use tips to anticipate and solve game design problems, sometimes even before the play testing phase. This talk will provide (sometimes fun!) brain facts and UX tips illustrated by examples from various titles. This talk will cover some brain facts relative to perception, attention and memory, and how this knowledge can be applied to game design (UI, story, mechanics, levels, sound, etc.). It will also cover UX guidelines and propose concrete examples, mostly from Epic Games. The target audience for this talk includes the UX experts, gameplay programmers, producers, designers and artists who have to work together toward the same goal: offering the best intended experience to their target user in a timely and efficient manner. Celia Hodent holds a Ph.D. in cognitive psychology, initially specializing in the development of intelligence in children and adults. Early in her career, Celia stepped aside from academic research to work with an educational toy manufacturer, VTech. Celia joined Ubisoft Paris in 2008 to help the editorial team to translate neuroscience knowledge into game design features. She later worked for Ubisoft Montreal and LucasArts. She joined Epic Games in July 2013 to help guide the studio toward improved user experience practices. Celia's main focus is to use psychology and neuroscience knowledge concretely to solve design problems and make sure the player experience is always enjoyable and emotional. As always with our meetups, this is not a "sit back and listen" meeting, but a chance for us to bring together a cross disciplinary group of people to think about the relationship between UX and technology. Mostly though, we'll get to know one another, and have some fun. RSVP and send your questions in advance using the buttons below. Also, please forward this email to whomever you think might be interested! nexUX Meetups take place in the James B. Hunt Library on NCSU’s Centennial Campus. Events will be held in the Duke Energy Hall of Hunt Library, with a few exceptions. 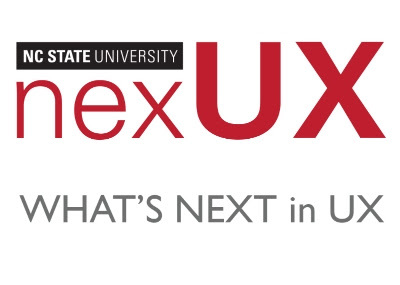 You've found NC State Computer Science's course on user experience. You'll find all manner of course content here.